We have restored the audio recordings of Larry’s conversations with Pamela which were on the original Failed Angle web site. They can be found here. We’ve added a new presentation some of the facts and opinions to date on the matter of Larry Norman’s paternity of Daniel Robinson, and invite input. Di Sabatino and Andrew Wallace have been telling people that they think Larry’s brother Charles Norman isn’t actually his brother, but his son. In response to this ridiculous claim, this site posted Charles Norman’s birth certificate which disproves this bizarre allegation. Shortly thereafter, David Di Sabatino claimed that the birth certificate has been “doctored” and that he has seen a “different” birth certificate for Charles Norman that contradicts the one posted here. Both he and Andrew Wallace still refuse to retract their errant statements since it would damage their credibility, I have therefore found it necessary to post undeniable photographic proof that they are wrong. YOU CAN SEE THESE PHOTOS HERE. Jeff Taylor, Ph.D sent in his observations on the Fallen Angel movie. We thought it warranted some space here at FailedAngle.com. It’s quite well done. The parable / parody page has been added to the site. It’s a humorous look at the spin Di Sabatino put in his Fallen Angel film. On June 1st, Charles Norman was interviewed by Mike Rimmer for Cross Rhythms Radio in England. In this lengthy live interview, Norman talks about the Fallen Angel movie, the Failed Angle web site, and the ongoing false allegations against Larry Norman. It’s quite an interesting listen. You can download or listen to the MP3 here [MISSING]. If you have any problems hearing it, or have any comments on the interview, please send me a message at the feedback page. Thank you for taking the time and effort to share the truth with the rest of the world. I’m under no illusions that LN was perfect. I’m not and I don’t know anybody who is. Did he father a child out of wedlock? Maybe, maybe not. It’s none of my business. It’s wrong if he did and if he lied about it afterwards, but I’ve got my own sins to worry about. But now David Di Sabatino and Randy Stonehill have taken it upon themselves to make it my business and the business of everyone else on the planet. This being the case, now I’m curious about the accuracy of the claim. I get the impression that Di Sabatino is a social misfit who attached himself like a parasite onto Larry at a point when he was vulnerable, insinuated himself into his life, and had a love-hate relationship with someone he envied. He hoped—perhaps subconsciously—to gain some reflected glory by being associated with a genuine star. Upon initial completion of the movie, Di Sabatino was interviewed by an Orange County journalist: “The film, he says, is ‘my attempt to understand why [Larry Norman] was doing this to me.’ . . . My conceit or naiveté in beginning this whole ordeal was that there was a rational person somewhere in there that you could reason with,’ he says. ‘“Larry, your career is in the toilet. You are playing concerts to 100 diehard fans in your own back yard. Let me tell your story in such a way as to rehabilitate you. You are going to have to admit to some stuff . . . but do it, take your lumps, and people will respond favorably.” I didn’t realize that there wasn’t a rational bone in his body.’” (http://www.ocweekly.com/content/printVersion/262831) Note Di Sabatino’s unintended revealing of narcissism and arrogance. When the would-be savior was turned down by Larry Norman, he [DD] turned on him with a vengeance. I get the impression that Stonehill is a self-seeking liar. I wasn’t impressed the first and last time I saw him in concert, in the early 1980s, with either his seriousness or spirituality. I think he’s someone who was lucky, or blessed, enough to hook up with Larry but he grew to resent his mentor over time. I could be wrong, but these are my impressions. I read Norman’s letter to Stonehill, and I read Stonehill’s letter to his ex-wife, I read the letters from Pamela, and I read the Internet exchanges between LN and Di Sabatino, and they tell me all I need to know. Still, I’m interested in reading more! I guess it’s voyeurism, in a way. But I’ve always been interested in the search for truth and the pursuit of justice, not to mention conspiracies. I think we’ve got all of the above going on here. As you say on your opening page, even if all of the allegations are true, the “documentary” is a diabolical exercise. (The word Devil means slanderer or accuser.) Dredging up personal sins from years ago and making money off them? Bringing an over-the-hill CCM star back into the spotlight? Stonehill especially should be ashamed of himself. Hooked up with a guy who is now saying Charles Norman is also Larry’s illegitimate son? Wow. Stonehill also seems like an ingrate. If it weren’t for Norman, where would the guy be today? It’s unlikely he would have had the small taste of celebrity he’s enjoyed within the Christian subculture. 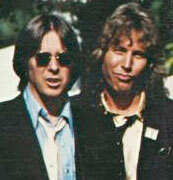 His best work was with Norman in the late 1970s. He repays that debt by copying the arrangements of his most famous songs and using them as the soundtrack for a hatchet job against Norman. Di Sabatino keeps saying Larry Norman never admitted to any fault, any sin, any weakness. That’s absurd. I’ve been reading and listening to him since 1979. His songs, liner notes, interviews, and comments on stage constantly acknowledged the fact that he was fallible and imperfect. His letter to Randy is full of apology and regret. Even his Internet exchange with Di Sabatino is, overall, respectful and humble. What is the song “I Am a Servant” if not an eloquent testimony of failure and weakness? There’s no cover up there. I became a fan of LN as a freshman in college. I was a relatively new Christian. When I first heard In Another Land, it wasn’t just the music that blew me away. It was the liner notes and the interview (even if the questions were self-written…who cares…McCartney did the same thing with his first solo LP). There was a depth to Larry that instantly appealed to me—not just spiritual, but also intellectual and artistic. He became my favorite singer and although I left the CCM ghetto long ago (repulsed by its shallowness and worldliness), he remains in my all-time top four, after Dylan, the Beatles, and U2. So I’m still a fan. It doesn’t mean I think he was incapable of fornication or adultery, or fathering a son and not acknowledging it, or resume-padding or unfair characterizations of enemies, etc. He was a man. He may or may not have done some of those things. But I also know he was deeply committed to the Lord. He wasn’t a con artist. He had a genuine heart for Jesus Christ. I’m a fan but I’m not star struck. I grew up. I’m not sure that David Di Sabatino ever did. There’s something twisted about his personality. Almost like a stalker. Stuck in some adolescent stage that has delusions of grandeur and Randy Stonehill (or whoever financed his movie) is helping him to live out those delusions at the expense of other people . . . and the Kingdom of God. Fallen Angel is an abomination on all kinds of levels. Recently, I’ve had the privilege of getting to know Ralph Nader on a personal level. This has been a thrill for me, as someone who’s supported him for president. What a relief to learn that the private man is the same as the public man. The admiration was not misplaced. Ralph isn’t a creep or a phony as a human being. He’s kind, polite, smart, and funny. That’s the exact same impression I get from reading Larry’s lengthy Internet rebuttal to Di Sabatino and his letter to Stonehill. The same qualities I’ve appreciated in his songs are obvious in his letters. The nuance, the sensitivity, the dislike of cant but regard for other people’s feelings and dignity. They evidence an intelligent, knowledgeable, balanced, mature individual, with a Christlike spirit at the center. I don’t get that impression with Di Sabatino. Quite the opposite. I think the Australian woman’s claims about her son were first contained in a letter posted on the Daniel Amos website. It’s quite a cozy little circle they’ve got going there—about as small as the Norman family that they are so quick to deride. I know Larry recognized the genuine talent of Randy Stonehill and Terry Taylor, and he spoke highly of them in public during his last years. It’s too bad they can’t return the favor. I think teaming up with Di Sabatino poisoned the well and encouraged their worst instincts rather than their best. I have a PhD in political science from the University of Missouri. History was my undergraduate minor and graduate outside field. Political history is one of my specialties. As a political scientist and historian, I know there is a certain level of research and evidence necessary for credibility when advancing theories and publishing assertions. Fallen Angel does not begin to rise to that level. At first glance, the recorded testimony of so many LN friends and colleagues from the 1960s and 1970s seems damning. Less so upon closer inspection. First off, it’s not testimony given under oath. There can be no legal repercussions for slandering a deceased public figure. You don’t need a PhD to realize that many politicians lie on a regular basis. They look straight into the camera and lie. Many of them are professed Christians. Why should we assume a Christian entertainer is incapable of doing the same thing? Some folks are sociopathic or delusional. This may or may not be true in this situation. We do know that no evidence is given for anything that is contended about Larry Norman. We are expected to take the word of the people being interviewed. No documents are shown. Why, for example, does the camera not show the supposedly incriminating emails from Norman to the family of his supposed illegitimate son in Australia? Why haven’t those documents been posted online? What about the birth certificate for the boy? Who was identified as the father on the certificate? The mother complains that Norman didn’t sign it, but fathers never sign birth certificates (at least in the U.S.). Hospitals, however, do record the name of the father as given by the mother. The main accusers in Fallen Angel are cult members who were in the band People in the 1960s, a few men who were business associates who became commercial rivals of LN in the 1970s and 1980s, and his first ex-wife. All have obvious reasons for holding a grudge and bad-mouthing Norman. The Scientologists dislike his Christianity. The disgruntled Solid Rock men are exacting long-delayed revenge. His former wife is overlooking, on camera, her apparent adultery and drug use while they were married. Still, to her credit, Pam had second thoughts about Di Sabatino after her on-camera interview. The most interesting thing is who does not appear in the “documentary.” Nobody from the Norman family appears. Norman’s second ex-wife does not appear. (She was first married to Stonehill so she would have an especially interesting perspective.) His friends Frank Black and Allen Flemming do not appear. An even older friend, Cliff Richard, was interviewed for hours; all but a few seconds of his comments ended up on the cutting room floor. Gene Mason, co-vocalist of People, is absent. Alex MacDougall, who drummed for Daniel Amos and LN, is absent. Same with Billy Batstone, bass player for Norman and Stonehill. Ditto Mark Walker, drummer on In Another Land (LN) and Welcome to Paradise (RS). When Larry died, Walker recalled, “It’s such a blessing to see how he lived for our Lord and ‘lived’ Him in all areas.” Where’s keyboardist Dan Cutrona, who began working with Norman in the studio and in concert in 1979? Surviving big-names from the early Jesus Music era are absent: John Fischer, Chuck Girard, Nancy Honeytree, Paul Clark, Darrell Mansfield, Phil Keaggy, Barry McGuire, and 2nd Chapter of Acts. Malcolm Wilde and Alwyn Wall, who were musical contemporaries of Norman and Stonehill in the 1970s, are not found. Arthur Blessitt, a fellow Jesus Movement pioneer, is nowhere in sight. When Norman died, Blessitt commented, “He came up with the ‘One Way’ finger pointed toward heaven . . . We did Jesus marches and Jesus rallies together across the U.S. and England. Larry had passion for Jesus mixed with an understanding of people. . . . Larry was a Jesus revolutionary owned by no one but his Lord. He cared, loved and stayed faithful to following Jesus.” Maybe that’s why Blessitt does not appear in the movie. His recounting of the facts undercuts the drama of the storyline. If Larry Norman were the dishonest jerk, the demonic “fallen angel,” he is portrayed to be, surely someone else outside the Scientology-Stonehill nexus would have noticed and been willing to publicly say so as part of a cautionary tale. The first album of the great Mark Heard was produced by Larry Norman and put out by Solid Rock in 1979. My impression of Heard was that he was a man who took his Christianity very seriously and had considerable intellectual and artistic depth. I think it’s telling that Mark Heard continued to work with Larry Norman until Heard died in 1992. To sum up, I don’t find the Fallen Angel thesis to be believable. It’s too obviously a revenge piece. You can see this by watching the trailer. One participant asks, with feigned indignation, “Why is the Devil singing the music?” By the time one gets to the trailer’s end—a cutesy cartoon of Larry Norman removing an angel mask, replete with halo, and putting on a devil mask—any knowledgeable and objective person will recognize this movie for what it is and understand that it lacks seriousness. The “Jester Media” designation for Di Sabatino’s movie company is a Freudian slip. The movie itself is not just a missed opportunity. It is a topsy-turvy hit piece that would be funny if it were not defaming a good man and being taken seriously by Christians who do not know better. Charles Norman: Brother or Son? David Di Sabatino, Andrew Wallace, and their followers have been insisting that Charles Norman is actually Larry Norman’s son, not his brother. When they were recently presented with a copy of Charles Norman’s birth certificate which proved them wrong, they called the document a forgery. David Di Sabatino has even pushed all credibility by stating that he has been shown a DIFFERENT copy of Charles’ birth certificate (as if someone is out there walking around showing someone else’s birth certificate to people!). The reason Andrew Wallace and Di Sabatino may be denying this is that if it’s proven that Charles is really Larry’s brother, their credibility takes a another severe blow. Andrew Wallace and Di Sabatino have both been confronted with the evidence so far, and they have both decided to neither comment nor retract their statements. If they admit that they were wrong, people are going to wonder what else they were wrong about besides this reckless accusation. Di Sabatino’s reputation as a journalist will be even more damaged than it already is, and Andrew Wallace will come off as someone who is extremely misinformed in his claims about Larry Norman’s history of paternity. If they continue to deny the authenticity of Charles’ birth certificate, they will look even more foolish than they already do. It’s a catch-22 situation for them, but that’s where you end up when you spread lies and innuendo and get caught. Below are photographs of Mrs. Norman and her newborn baby, Charles. 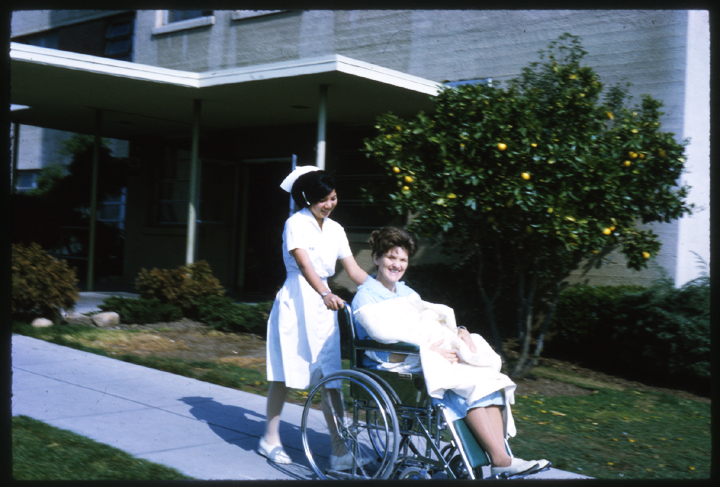 Here’s Margaret Norman (Charles’ mother) being wheeled out of O’Connor Hospital with the newborn baby, Charles. 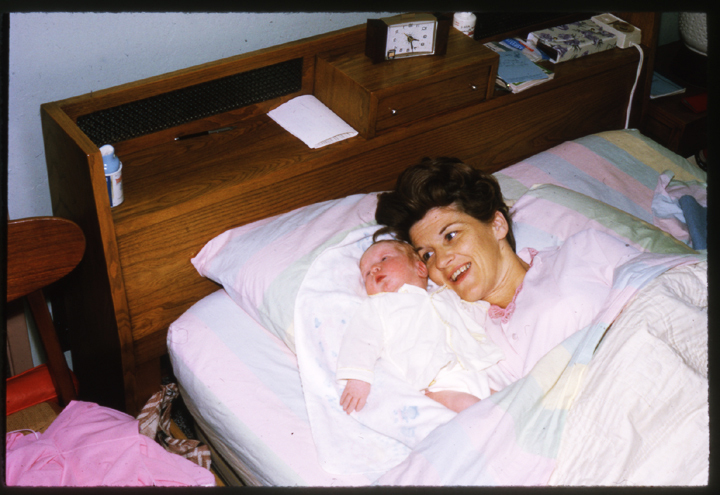 Here’s Margaret Norman and Charles in his first day home from the hospital. 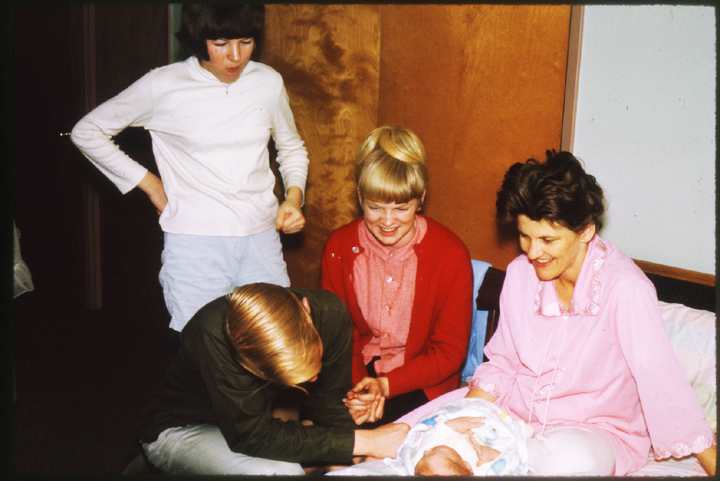 Here are Charles’ siblings Larry, Nancy, and Kristy meeting their little brother for the first time. For those of you who now realize that you have been duped by David Di Sabatino and Andrew Wallace and had perhaps joined in spreading rumors about Mrs. Norman and her sons, you are welcome to send the Norman family a note or an apology via my address postflemming@gmail.com and I will forward it to them. Photo courtesy of Jon Reid. David Di Sabatino has been obsessed with Larry Norman for years, or so it seems. He first started presenting his theories as fact in a bibliography he compiled, and later in Internet discussion lists. When Larry artfully took David’s theories apart, and then basically offered access to many of the documents I am citing here plus the opportunity to interview Larry and his whole family, David did not accept the offer, apologize or make any sort of statement. He just retreated and waited awhile before reintroducing his imagined scenarios all over again to a new crowd. I presume that Di Sabatino thinks he can now trumpet his theories without the hindrance of the truth being that Larry Norman is no longer around to defend himself. Di Sabatino admitted this himself. I’m not a lawyer obviously, but from what I understand you are making threats about things that would not get you to first base in a court. 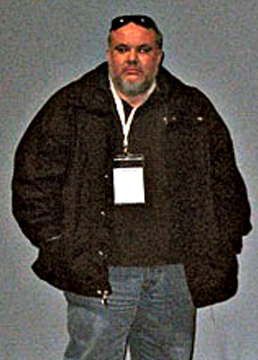 Since Larry is dead, defamation and privacy claims cannot be brought. Again I ask what species of Christianity is this? One of the first public encounters between Di Sabatino and Larry Norman occurred in March of 1999 on a Jesusmusic.org Internet music discussion list. Di Sabatino had accused Larry of many of the same things he covered years later in the Fallen Angel movie. Larry responded to these accusations clearly and eloquently. The following documents are lengthy but well worth reading. They are the closest thing to a response to the Fallen Angel movie that we’re going to get from Larry Norman himself. And I think they also offer insight into David Di Sabatino. The younger David that Larry addresses in these messages is the exact same older David that I observe in current statements and interviews. If you’ve read any of his recent interviews or publicity maneuvers you’ll know what I mean. Here is Larry’s reply to Di Sabatino’s accusations over a decade ago. Click for a PDF file. Larry also felt moved to defend himself against statements Di Sabatino had made in a bibliography he had compiled. Click for a PDF file. A few days after posting these messages to Di Sabatino, Larry apologized wholeheartedly for responding at all. He felt that the duty of a Christian is to pray for someone, instead of to respond to their accusations and debate with them. Click for a PDF file. Here is a brief list of what David Di Sabatino has been up to during the making of the movie and in the years leading up to it. I’ll expand on each of these points in the near future as time allows. Di Sabatino has posted the phone numbers and addresses of various members of the Norman family on the Internet, including that of Larry Norman’s 83 year old mother. (To link to his post would defeat the purpose of protecting the Norman family’s privacy.) Mrs. Norman is the sweetest, most Christlike person I have ever met. When I discovered this action against her by Di Sabatino was when I decided to take off the gloves and go public with all this information. Where did these sorts of despicable tactic become acceptable in the Christian community? What sort of theologiy produces these sorts of ethics? Di Sabatino has sent threatening email to Charles Norman’s wife Kristin. Again, to post this email would be against the purpose of retaining the Norman family’s privacy. Di Sabatino, in forums, articles and chat-rooms, has repeatedly ridiculed and accused the Norman family of being liars. It is telling to listen to the diatribes against Larry Norman and his family that David has unleashed in radio and Internet interviews. Upon first hearing, Di Sabatino comes across as almost articulate and perhaps a well-versed authority on Larry Norman. But when you scratch the surface and explore the actual physical documentation (as opposed to hearsay), you realize that this self-proclaimed expert on Larry Norman has either bought into the tales told by a few disgruntled former associates that Larry worked with for a brief period (1976 – 1980), or he is manipulating and editing the time-line of history to accommodate the story he wants to tell. Di Sabatino has admitted in a radio interview that he purposefully didn’t include opposing commentary in his film, because it was coming from a perspective that he didn’t share. In otherwords, it didn’t support the allegations that Di Sabatino has made against Larry Norman in his movie. He has been spreading false rumors about members of the Norman family publicly, and in chats on Facebook, etc. The most bizarre of these is that Di Sabatino has been telling people that he thinks Larry’s brother Charles isn’t actually his brother, but his son. According to Pamela Newman, one of the early screenings of Di Sabatino’s movie “Fallen Angel” contained a segment which made this absurd allegation. Here is Charles Norman’s birth certificate in JPEG. Recently, Di Sabatino got into a conversation / argument with someone who was questioning his line of logic. Apparently, another bizarre theory going around is that Larry Norman was contractually signing other popular artists to his record company so he could waylay their careers, thus keeping himself the most popular Christian artist. When questioned about this and asked for evidence, Di Sabatino got into the following dialog. You can read the transcript here. It’s an interesting way for Di Sabatino, who studied theology and led worship services, to communicate with someone who is merely questioning his speculative accusations. [WilliamT] 12:29 pm: David, why did you sue Solid Rock in a California court? When Fallen Angel was finally released to the public, on March 1st, 2009, Charles Norman issued a cease and desist notice. Di Sabatino had not asked permission to use Larry Norman’s music and other copyrighted items such as photographs owned by Solid Rock (Which is what David did with Larry’s music in his first film, Lonnie Frisbee: Hippie Preacher). Di Sabatino had, however, asked the permission of other people who contributed their copyrighted material, and in some cases paid them for their material, but he did not ask Solid Rock. Rather than replying to the cease and desist notice by contacting anyone at Solid Rock or trying to suggest compensation for the copyrights, David Di Sabatino decided to take a much more heavy-handed approach. The lawsuit was filed on April 21st, 2009. On May 19th, 2009 Di Sabatino for some reason declared in a Yahoo chat group that he had “won the legal challenge.” This is nowhere near the truth as it didn’t go before a judge until nearly two months later. In July, after weeks of drawn-out negotiation and at least one cancelled film festival showing, a settlement agreement was arrived at. Di Sabatino and Norman settled the case out of court. Norman refused to consider taking any money, not wanting to sell out his brother’s legacy. Instead, he just wanted to walk away rather than get bogged down in a protracted case in a court nearly 1000 miles from his home. The case was closed by a Stipulated Consent Judgment, meaning that Charles Norman decided to concede on the condition that Di Sabatino adhere to a few of Norman’s stipulations, one of which was that Di Sabatino stop using the Larrynorman.net web address. You can request the transcripts of Di Sabatino’s lawsuit against Solid Rock and the attached stipulated settlement agreement by contacting the Clerk of the District Court and referencing the case number. The lawsuit documents are a matter of public record, but far too lengthy to post here. Pam Newman had an interesting encounter with Di Sabatino while he was putting together his movie. Here are some “fair use” excerpts from two emails Pam sent out after seeing the movie’s premiere in San Jose, California. Stay tuned for more information. Until then…. If I know for sure that it was God that brought us together, and not you pretending to be a really goody-two-shoes Christian since the age of “x” and, laugh about your little drug things as though they were really nothing and then, and then think that I had three cars and two houses when all of them were broken down, completely, you know, fantasy… fantasy brought us together… it’s not the same as God. I’d like to know that God brings us together. PAM: I was not going to lie to you. I didn’t want to have to go through that with you again. LARRY: I’d rather move everything out and then have to turn around and move everything back in… if it comes to that. LARRY: Well, you can’t say you would, you don’t know that either… maybe you wouldn’t. You have to go to court to prove something’s illegal, you have to take somebody to court, and I don’t really care about going to court. I don’t know what I want to do, I… don’t. You know, I don’t want to go to court about anything.